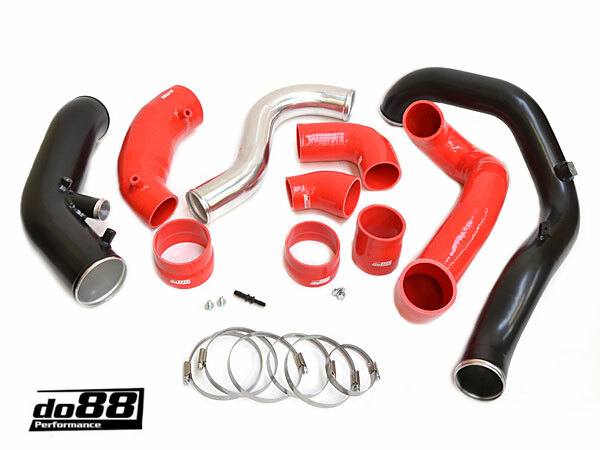 Exclusive kit for do88 UK (PFS) with black powder coated aluminium pipes. 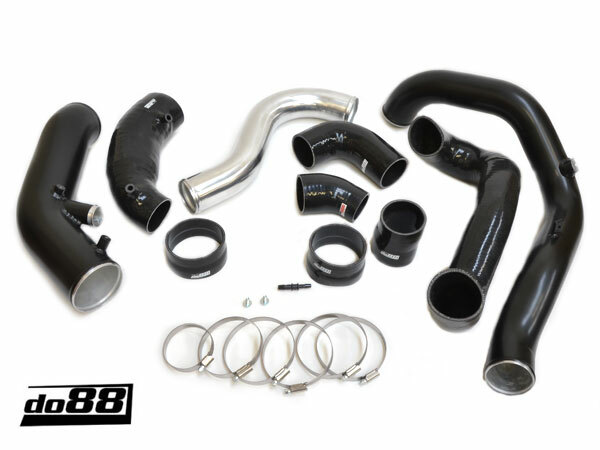 The lower, not visible, boost pipe is not powder coated to keep the cost down meaning we're able to offer this incredible performance kit as this great special offer price. To Fit: SAAB 9-3SS/SC 2006 onwards all 2.8T V6 models (B284). Please email us with your VIN prior to ordering if you would like us to check correct fitment for your car. Do88 strive to get the absolute maximum performance gain from this kit by using all of the available space from the original position, this results in this inlet pipe being almost too big for the vehicle. This means a good degree of persistence, persuasion and mechanical competency is required for fitting the kit! This upgrade kit offers a significant improvement over the original parts and is equally suited for someone wishing to replace a failed pipe on a standard engine or to achieve the highest possible horsepower from their tuned engine whilst retaining reliability. 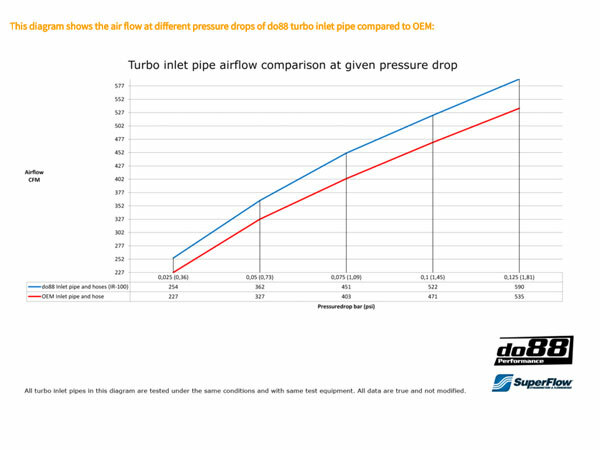 Do88's turbo inlet pipe has better air flow than the stock pipe and this is verified by the results of the SuperFlow SF-1020 flow bench test. The turbo intake pipe is 89mm (3,5 inch), outer diameter, all the way to eliminate all restrictions. Do88 turbo inlet pipe has an air flow at 0,125bar/1,81psi pressure drop 590CFM, compared to the OEM pipe that has 535CFM. The turbo inlet pipe is manufactured in 3,5” mandrel bent seamless aluminium pipe. 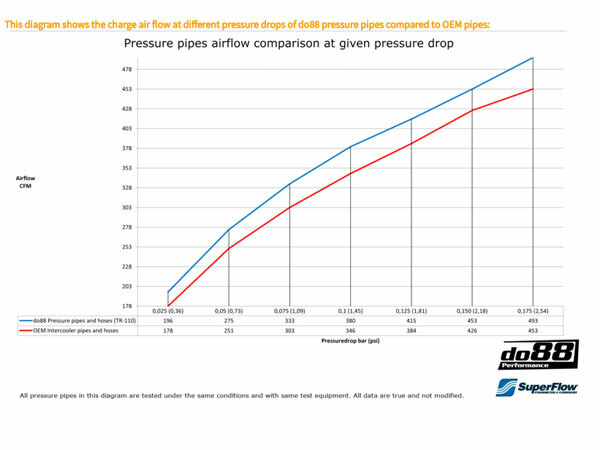 Air flow at 0,075bar/1,09psi pressure drop: 333CFM (303CFM), do88 10% higher! Designed to handle high pressure and temperatures! See enlarged image for test result data! This upgrade kit offers a significant improvement over the original parts and is equally suited for someone wishing to replace a failed pipe on a standard engine or to achieve the highest possible horsepower from their tuned engine whilst retaining reliability. Do88's charge pipe has considerably better airflow than stock, this is verified by several tests, both in car and on do88.se's own SuperFlow SF-1020 flow bench. The charge pipe between the tubo and intercooler is manufactured in 2,5” (63mm) and the pipe between intercooler and throttle body is 2,75" (70mm). Both pipes are mandrel bent seamless aluminium pipe. CNC machined sensor flange for best fit. Custom made high quality silicone hoses with 4 layers of polyester reinforcement and steel wire. These hoses can handle very high temperature and vacuum! Fitting instructions can be found here & here.